Acupuncture is miraculous system. If we combine it with a similar powerful therapy like Rekie supreme and complement them with cosmetological & photodynamic therapies, then it is possible to grow new hair on baldheads in 3 to 15 days of treatment. The number may be less but there will definitely be new hair coming out of follicles. Here are some microphotographs of scalp during treatment. A) Within 3 days microscopic dots of hair are visible. 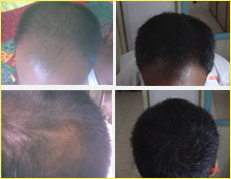 B) In 10 to 15 days, hair are visible without microscope. C) New hair grows slower in length. Many factors like diet may be playing important roles. Further research is necessary. D) In many instants there are more than one hair coming out of one papilla on the scalp. E) New hair are black, strong and normal in all patients, irrespective of age. Further research is on in our center. 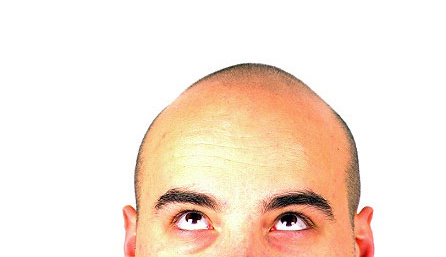 It must be remembered that acupuncture is well known for baldness treatments. In fact, there is a patent granted for treatment of Acupuncture in U.S.A. Though combined treatment regimen is many folds better.